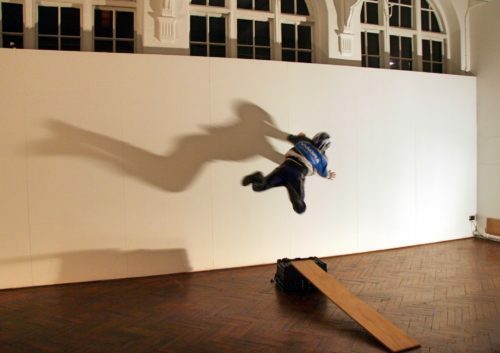 On 19 June at The Academy of Live and Recorded Arts, London MakeSpace Productions previewed its two new productions, Roxy Likes Cats and The Way Out, ahead of taking them to the Edinburgh Festival. Review by Elinor Rowlands. Roxy (Roisin Fahey) in Roxy Likes Cats. 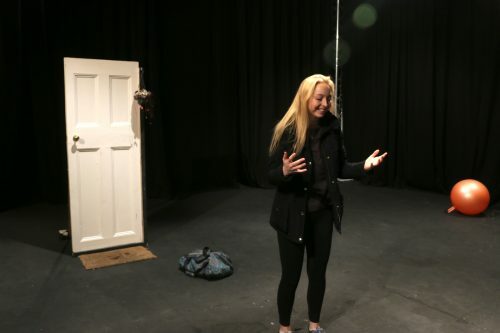 Grief and the discovery for the truth are two common themes addressed by novels or films, but rarely are these themes ever explored in such dreamlike fashion as they were by emerging theatre company MakeSpace Productions. Roxy Likes Cat was a short monologue following Roxy which shakes awake those trembling thoughts when bad news is delivered. Last night, Roxy had a phone call from her mum and the audience find themselves alongside her as she nears her family home. She decides not to enter, and instead has a chat with the audience. Roxy boldly suggests that the audience shouldn’t look so stunned “You’d think by your faces someone had died. Relax.” This does not ease the audience as she skirts around the perpetuating absence of her father who she remembers in the past. 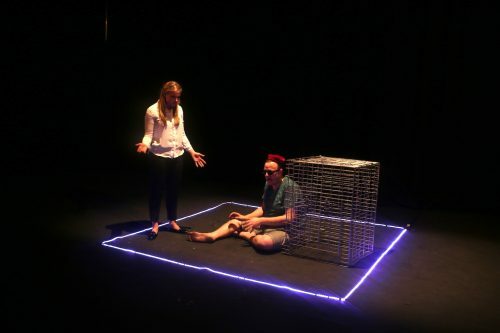 Quantum mechanics litters this play and the one after it, as Roxy weaves in stories about a man from Vienna called Shrodinger who carried out a thought experiment about a cat. Scattered amongst this story are others about her own cat, her father and growing up. She ends her monologue in revealing what happened to the cat, and this recurring theme of death aids her to put the keys in the door. The darkness that falls down on the audience as they are trapped in this unknowing of what had just occurred is immediately banished as the next play begins. Described as a dark, absurdist comedy inspired by the madness of modern life and the frustrations we encounter everyday living in the modern world, The Way Out begins in another world that does not appear of this time. The order of these scenes feel wrong and jarring from the start. Once Judy Gale (Alex Spooner), is introduced a sense of clarity occurs. Judy’s boss, Cass (Victoria Priddice), is hysterical, yet, their relationship is confusing due to Cass’s costume, satin pyjamas. Are they at work or in Judy’s home? Are they manager-employee or flatmates? It is this that detracts from the inciting incident where Judy receives an audio letter pressing her to attend an unknown address and then suddenly disappears. Judy Gale (Alexandra Spooner) and Lift Attendant (Jack Whitney) in The Way Out. From here, the audience joins Judy on her pursuit to find out who sent her the letter. Two security guards who mirror Tweedle Dee and Tweedle Dum converse with Judy and finally allow her into the building, a mysterious office block. Unlike Dorothy’s and Alice’s quests from the well-known stories, Judy’s only intention is to find out why she was asked to this building and who sent her the letter. Although her journey lacks depth, it hooks the audience in as we meet a variety of characters along the way. Notably, the lift operator, executed brilliantly by Jack Whitney who tends to his character as sensitively as writer (Michael Stacey) did. The exploration of impairment is in stark contrast to how structural oppressive theatre depicts disability. Instead, this blind character is depicted as wiser than all the other characters because he can see the most. Played with an absurdist sense of charm and playfulness not yet encountered due to the superficial and suspicious nature of the rest of the characters, this sense of injustice imposed by society on disabled people is highlighted when the lift operator is revealed again in a cage. 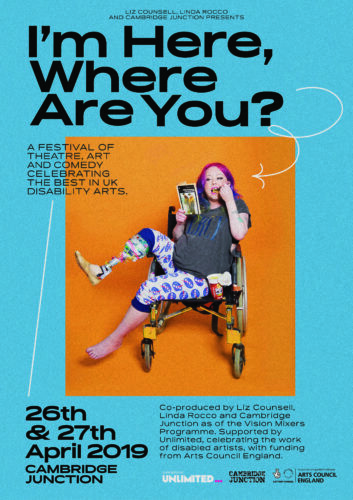 Stacey steers away from stereotype and shows only a truth that is so rarely portrayed in theatre when disability is portrayed. One hour of ‘down the rabbit hole’ was made all the more exciting because of director, Conrad Williamson’s choice of lighting. A stark stage where most, if not all, props were delivered through the use of lighting was effective and incredibly creative. It brought wonder and magic in a way that made the journey all the more exciting and relatable. The Way Out blended existentialism with elements of Kafka’s The Trial, yet this performance stood out because it was not trying to outdo absurdity. Instead, it gently explores the contrived nature of truth in a society that attempts to distinguish power from truth. In fact, when the stage went to darkness for the last time, the audience were not prepared because the hour had gone so quick. Both plays felt a little undeveloped, yet within the chaos the tide of magic and wonder rose high. As far as journeying again with MakeSpace is concerned, I’d happily raise my hand. The Way Out and Roxy Likes Cats are both on at Greenside @ Royal Terrace as part of Edinburgh Fringe 20-25 August.